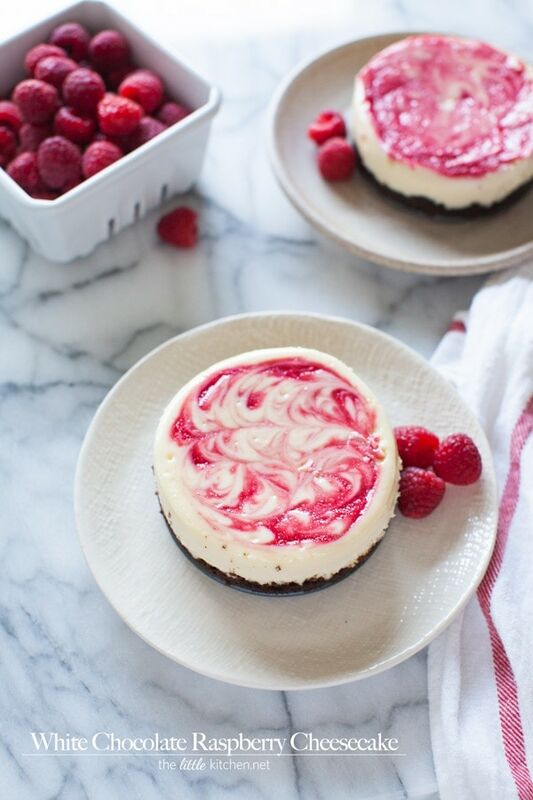 We recently went to a restaurant and had a white chocolate raspberry cheesecake for dessert…I told Curtis when we left the restaurant, I have to recreate that cheesecake! So when Driscoll’s approached me to join in on their monthlong celebration of raspberries, I jumped at the chance because I’m always buying Driscoll’s brand berries and I knew exactly what I wanted to make! And I even made them with my mini springform pans…mini is better, always, right? Even better, June means Curtis’ birthday and our anniversary…Curtis doesn’t like regular birthday cakes but loves cheesecake! So this is so perfect for us to celebrate and make our celebration that much sweeter! 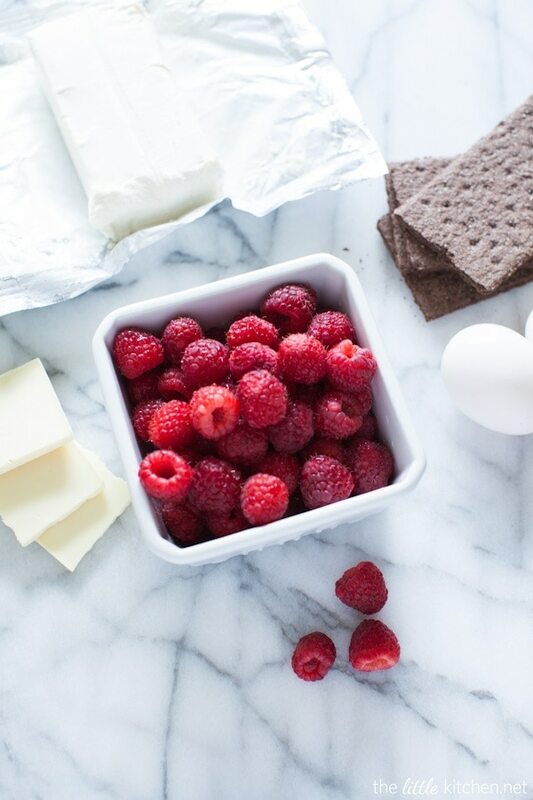 How do I love raspberries…let me count the ways. When they are in season, I love having them around to put on top my yogurt, to snack on, to put on top of salads (yes berries in salads!) and of course to make desserts. When I see the Driscoll’s name, I know I can count on quality. First wrap your springform pans in foil, along the bottoms. Then, melt the white chocolate. It’s important to use a good quality white chocolate bar. Chips will harden back up after sitting and we don’t want that to happen! Set the melted chocolate aside to cool. Place the raspberries, 2 Tablespoons of water and 1/2 Tablespoon sugar into a blender and pulse until completely blended. Then, strain the seeds out. 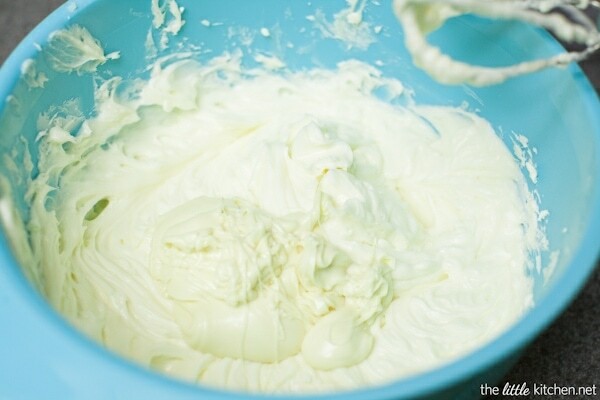 Whip the cream cheese in a large mixing bowl for one minute with an electric hand mixer. Add the melted white chocolate and mix together thoroughly. Next beat in the eggs, salt and vanilla extract. See how I wrapped the pans in foil? This is to keep the water bath from going into the pan. If a little bit of water gets in, that’s okay. 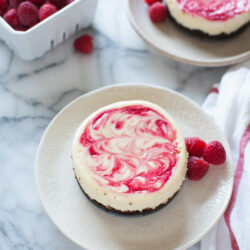 Add drops of raspberry to the cheesecake filling and then swirl with a toothpick. (or if you’re using a large 9-inch springform pan, use a roasting pan). Let them cool when they come out of the oven before refrigerating them for at least 4 hours. I refrigerated mine overnight. 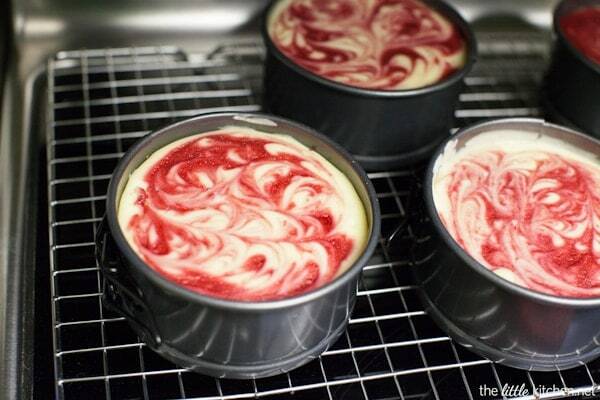 Or what your cheesecake would look like if you make it in a 9-inch springform pan. 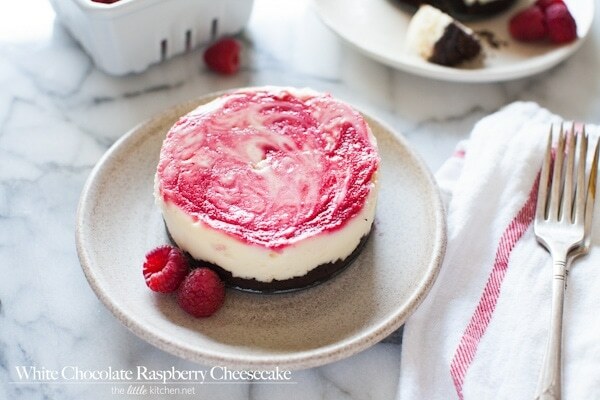 So good, nice and sweet from the white chocolate and the tartness from the raspberries…such a great combination! And with the chocolate graham cracker crust…it’s to die for! 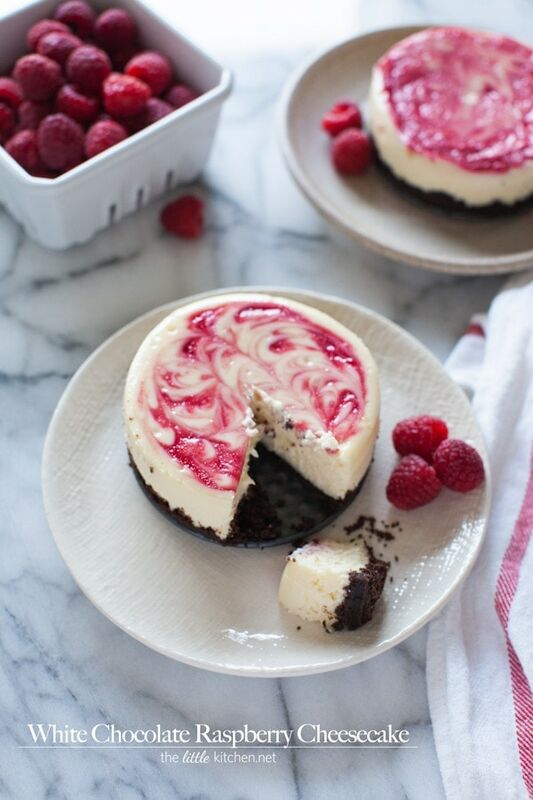 For other amazing raspberry recipe ideas, be sure to visit the Driscoll’s website. 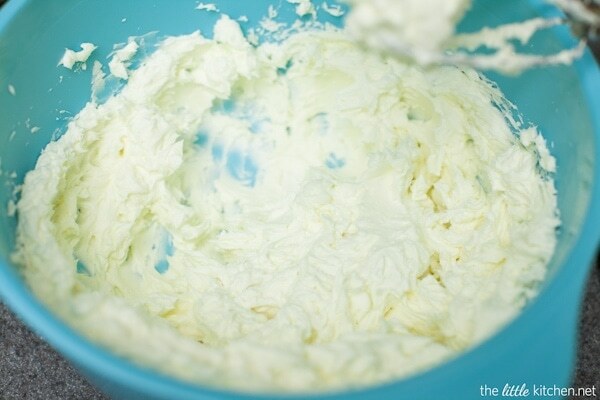 Make sure to place the cream cheese on your kitchen counter for at least 30 to 45 minutes. It's easier to work with when it's softened. Heat oven at 350 degrees F.
Melt butter in 10 second increments in the microwave. Place chocolate graham crackers in a large zippered plastic bag and close. Use a rolling pin to crush the graham crackers. Pour graham cracker crumbs into a bowl along with 1/2 Tablespoon sugar and butter. Mix thoroughly. Take a 9 inch springform pan or 4 mini springform pans and cover the bottoms with foil. Add graham cracker mixer and push down on the bottoms of the pans with your fingers. Bake the graham cracker crust for 10 minutes at 325 degrees. 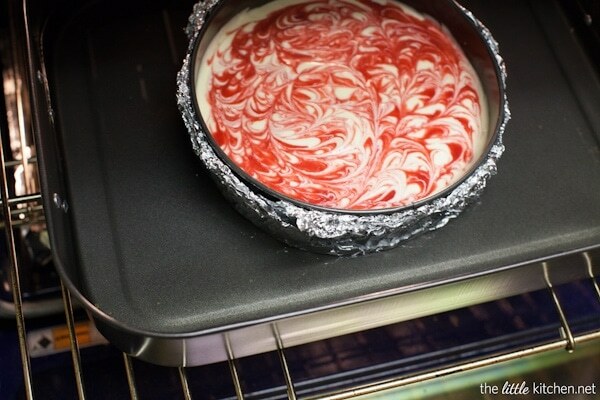 Remove from oven and allow to cool while working on the cheesecake filling. In a medium sized microwave safe bowl, add chopped white chocolate. Melt in the microwave in 25 second increments at 50% power. Add raspberries, 2 tablespoons water and 1/2 tablespoon sugar to a blender and pulse raspberries until they are blended. 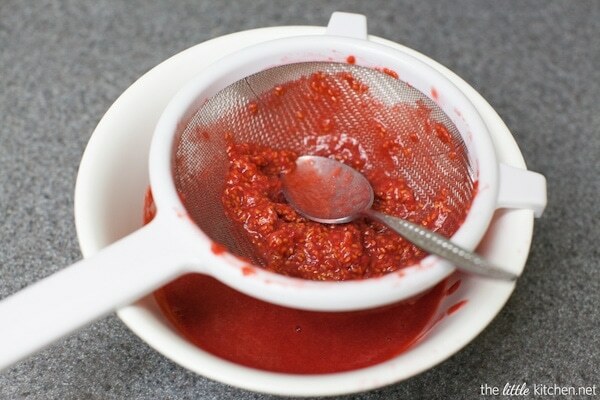 Place mixture into a strainer over a bowl and use a spoon to strain out the raspberry mixture and to keep the seeds from the mixture for the cheesecake. 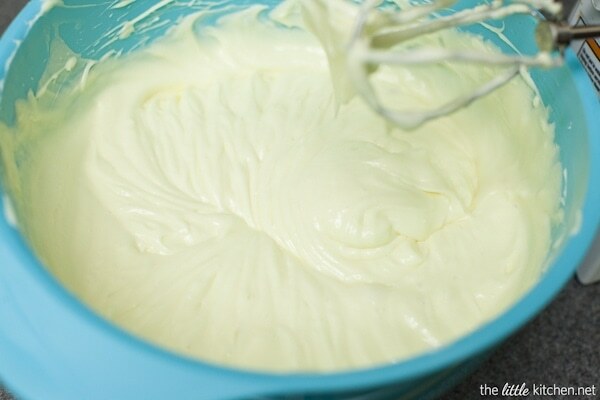 Add cream cheese to a large mixing bowl and whip with an electric hand mixer for about 1 minute. Add 1 cup sugar and mix thoroughly. Be sure to take a rubber spatula to scrape the sides of the bowl. 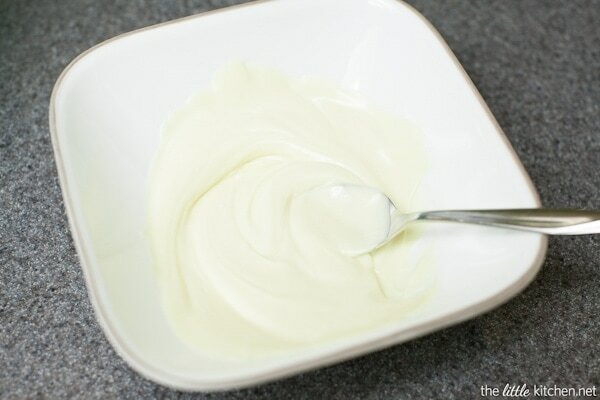 Add melted white chocolate and mix together. Add salt, eggs and vanilla extract and mix thoroughly. Add springform pan(s) to a large roasting pan or glass baking dish. 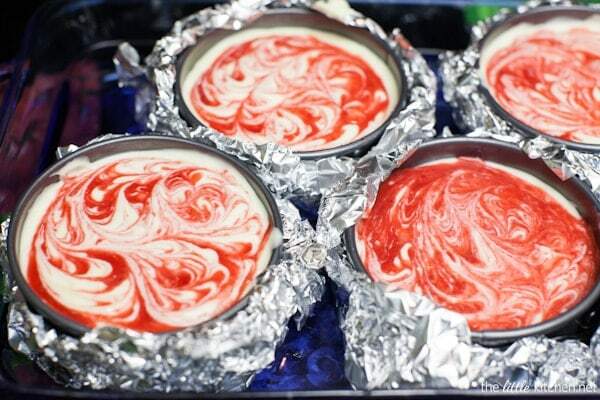 Pour cheesecake mixture into springform pan(s). 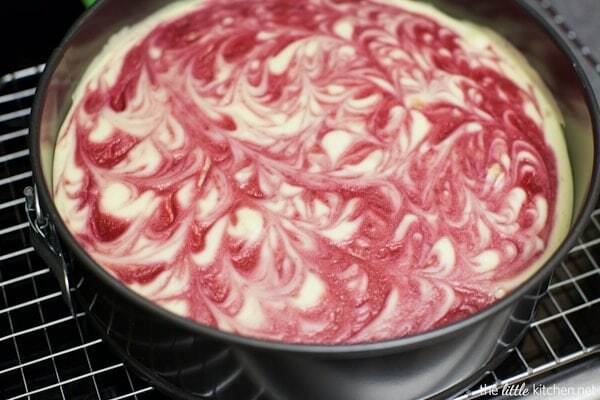 Using a teaspoon, add drops of the raspberry mixture to the cheesecake and use a toothpick to swirl it. Add baking dish to the oven and bake for 40 to 45 minutes if using mini springform pans and for a 9-inch pan, bake for 65 minutes to 70 minutes. The top will be set and may jiggle a little when you shake it. 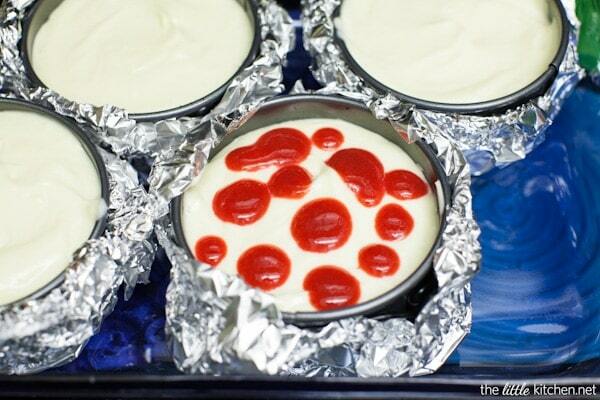 Allow cheesecake to cool on your counter on top of a cooling rack for at least 1.5 hours. Cover tightly with plastic wrap and refrigerate for at least 4 hours to overnight before serving. Note: If you're using mini springform pans, you will have a little leftover cookie crust as well as filling. Disclosure: This post is sponsored by Driscoll’s. All opinions are my own and I only work with brands that I love.